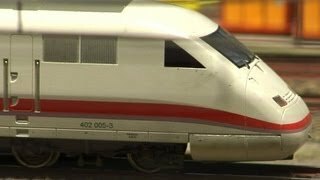 This awesome model train layout in HO scale is one of the largest model railroad layouts in Germany. It’s an amazing model railway layout with hundreds of digitally controled model trains. There are famous trains of the German Federal Railways, high speed trains and steam trains. This model railway layout is a permanent model railroad exhibit near Frankfurt/Main, Germany.